This Additional Tool is provided as a bonus tool to help automate and simplify the operations within Max & Maya as they apply to HeroEngine. 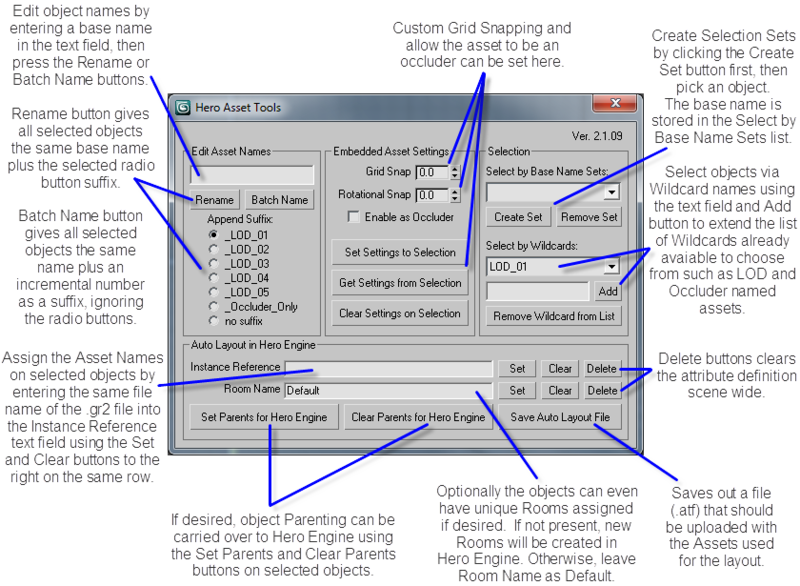 The Hero Asset Tools window has multiple functions that aid in asset naming, custom snap settings, and a method for automatic layout. Check the last 2 digits in the Version number found in the top right corner for the Autodesk Year Model that the script is written for. If this doesn't match the Year Model version of Autodesk software you are using, please visit the "Setting Up..." links in the See also section. Quickly rename selected Objects and apply Hero Engine required Suffixes for LOD models and Occluder meshes. Type in a name in the text field for the selected objects to change the name and choose "Rename" or "Batch Name" to apply. "Batch Name" button adds an incremental number as a suffix. "Rename" button uses the selected "Append Suffix:" radio button as the suffix. Use the "Append Suffix:" with the "Rename" button to apply LOD or Occluder suffix naming requirements. The "no suffix" option should be used if the selected objects are not LODs or Occluder Only objects. Hero Engine allows for custom Grid Snap settings per Asset! This is very useful for creating segment pieces such as architecture set. "Grid Snap" is for positional snapping. In HeroBlade, hold "Ctrl" key while using the Move tool to grid snap. "Rotational Snap" is for rotation snapping. In HeroBlade, hold "Ctrl" key while using the Rotate tool to snap in angles set on the model. "Enable as Occluder" tells HeroEngine that this asset can use the mesh as an Occluder. This is useful for performance as long as the selected mesh is low poly and doesn't have a lot of concave sides within the silhouette of the model. "Set Settings to Selection" button will apply the above settings to the selected objects in the scene. "Get Settings from Selection" button will read the current selected object settings and display it into the above window controls. "Clear Settings on Selection" button will delete everything in the "User Defined Properties:" section of the selected asset's "Object Properties". These Asset Settings are stored under "Object Properties" in the "User Defined" tab. 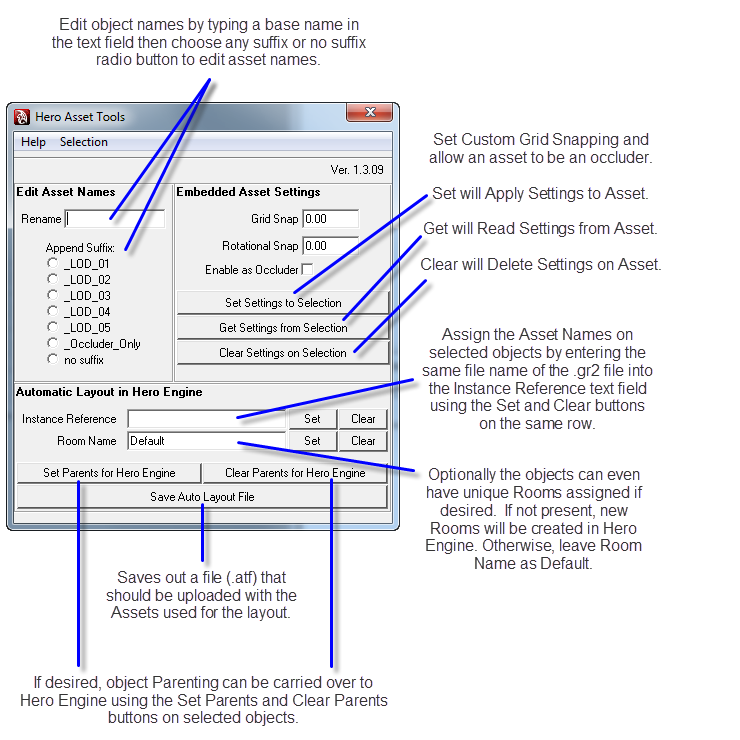 It is recommended to only use the "Hero Asset Tools" window to change these values to prevent errors. Press "Create Set" button first, then pick an object for it to appear in the "Select by Base Name Sets:" drop down menu. The "Select by Base Name Sets:" drop down menu will select objects with the same base name in the list. "Remove Set" button will remove the selected item from the "Select by Base Name Sets:" drop down menu. The "Select by Wildcards:" drop down menu is preloaded with "LOD_01", "LOD_02", "LOD_03", "LOD_04", "LOD_05", and "Occluder_Only". Enter new wildcards into the text field and press "Add" button to populate the "Select by Wildcards:" drop down menu. "Remove Wildcard from List" button will remove any newly added wildcards from the "Select by Wildcards:" drop down menu. To open, click on the Asset Tools icon on the "HeroTools" Shelf in Maya. Type in a name in the "Rename" text field for the selected objects to be renamed. Choose a Radio button under the "Append Suffix" to add a suffix and apply the name change. "Clear Settings on Selection" button will delete everything in the "Notes" section on the selected object's transform nodes. These Asset Settings are stored in the transform node of the selected object under "Notes".